Floating Stock, Share Float or Float refers to a company’s shares that are bought and sold freely by the public without any restrictions. It is the total number of shares that are available in the market for trading. In simple words, it is the shares available in the open market that a company has to trade. It indicates the total shares that are actually available in the market for the investors. A company that has a stock with a small float is higher in volatility than a stock with a large float. Investors tend to invest in stocks that have a higher floating stock due to the availability in the market. When the share float is low it causes obstruction to active trading due to the unavailability or scarcity of the stock in the market. Company’s issue equity or exercise their convertible debts when the share float is low. Subtract its restricted stock and closely held shares such as those shares employees and major shareholders own from its total number of outstanding shares. Outstanding shares are those shares that a company issues and sells to investors. Restricted stock is the share that is restricted temporarily from trading because of the lock-up period after an initial public offering. It is the non-transferable stock of a company. Closely held shares are the shares that are owned by major shareholders, insiders and employees. PQR Inc. has 10 million outstanding shares out of which 5 million shares are owned by large institutional investors and 2 million shares are owned by ABC Inc. The management and insiders own 1 million shares and 400,000 shares are unavailable as these are part of PQR Inc’s Employee Stock Ownership Plan (ESOP). This means 1.6 million shares are Floating Stock. The percentage of floating stock out of the total outstanding shares for PQR Inc. is 16%. Many companies like PQR Inc. will issue additional outstanding shares into the open market to raise more capital, when it does its floating shares will increase as well. But if PQR Inc. decides to exercise a share buyback it will decrease its outstanding shares and decrease the percentage of shares floating. Share float helps investors in understanding the total shares available for trading in the open market. It helps the investor in deciding whether or not to invest in a company. Higher the percentage of share float higher the number of investors wanting to invest. Large share float attracts more investors due to the availability of the shares in the market and its ease to borrow and short sell in the market. Higher the percentage of floating stock, higher the number of investors wanting to invest. Shares Float gives the company a clear picture of how many shares are owned by the public, on the basis of this number, the company can make decisions on whether to increase or decrease the number of shares outstanding. It helps in identifying the volatility and liquidity of the stock. It reflects the goodwill of the company. Any news that is related to the industry or the sector in particular, can impact the volatility and liquidity of stocks with low floats which can give a good opportunity for investors to exit or sell the stock after finalizing a good trade. A stock that has a small floating stock can result in investors refraining to invest due to the scarcity of the stock in the market. 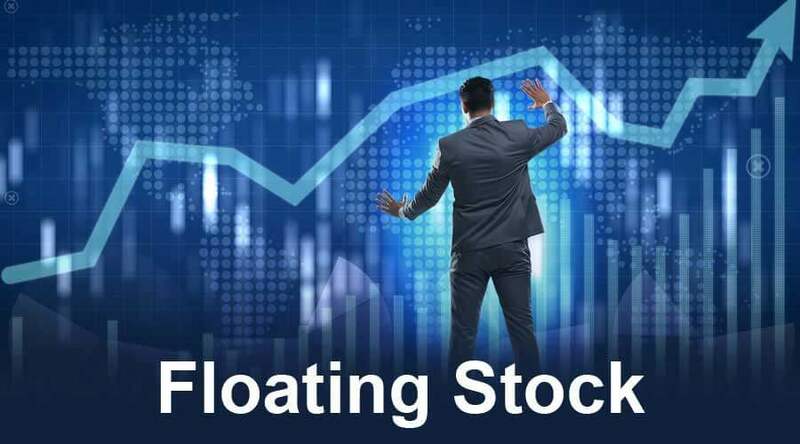 Floating stock can ward off any investors only because of the number of shares in the market available for trading without recognizing the actual potential of the company. A company may issue additional shares just to increase the floating stock even when the business does not require additional funds which would result in Stock Dilution which may dismay the existing shareholders. It is easy to manipulate low float stocks with price action influenced by large orders. The bottom line is that active trading is obstructed due to a smaller float making it difficult to sell long positions. Institutional investors will usually refrain from investing in companies like PQR Inc in the above example. Since small floats have fewer shares to trade and therefore more volatility. Smaller float showcases limited liquidity and wider ‘bid/ask’ spread. Institutional investors will look for big floats so their purchases do not affect the share price. 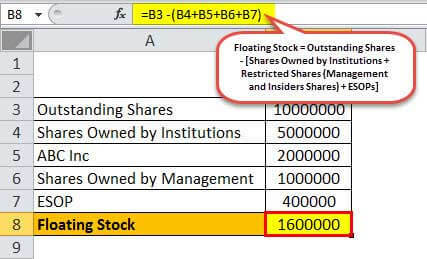 Typically a company’s floating stocks tend to increase once the shares are issued in the secondary market for business expansion or to make an acquisition or when employees exercise their stock options. When a share buyback is exercised by a company the outstanding shares in the market reduces and so does the floating stock. A stock split increases the total shares outstanding which eventually increases the floating stock temporarily. When a reverse stock split is exercised the outstanding shares would be diminished thereby reducing the floating stock which would make it harder to borrow and discourages short selling of the shares. The floating stock of a company is an important factor for the investors as it gives a picture of the available shares to be bought and sold in the open market. Shares within the float are not in the control of the company as this is traded by the public in the secondary market. So any action like sale and purchase does not affect the floating stock of the company as these changes do not impact the number of shares available in the market for trade. The floating stock is not affected by the trading of the option. The management can decide on whether to issue new stocks, perform stock splits or reverse stock splits on the basis of the floating stock. What is Common Stock Formula?